Photo: Indulge your inner beach bum. The Togean—or Togian—Islands are a little-visited archipelago in the southern region of the Tomini Sea in northern Sulawesi. Why go to the Togean Islands? Famous for both their difficulty to reach and diving, the archipelago comprises seven primary islands near the centre of a global hotspot of biodiversity known as the coral triangle. Home to a great number of rare marine and terrestrial species, most tourists who come here are divers or snorkellers hoping to see some of the world’s best marine life in unspoiled surroundings. Are the surroundings unspoiled? Not really. While above the water, the islands are little developed, below the waves it’s a different story. Since the early 1990s, highly destructive fishing methods like dynamite fishing and cyanide poisoning have been widely used in the Togeans, causing a steep decline in fish numbers and immense shallow reef damage. Sharks, large fish and turtles are rarely seen, especially compared to locations like Komodo National Park, which has seen better (though not perfect) protection. Over two separate two-week trips to the Togean Islands we saw not a single example of boat pilots running snorkelling trips using buoys; anchors were freely thrown onto reefs and, while boat pilots made some effort to stick to already smashed channels, attention was cursory. These are very simple practices that would have a significant impact. While evidence of logging is rarely seen from a boat, under the water clear examples of coral smashed by sunken logs can be seen on some house reefs. Other effects, such as silt run off from cleared areas of jungle for cash crop farming, is less obvious to the untrained eye. Rising sea temperatures and crown of thorns starfish have also caused significant damage to the reefs. Napoleon fish are a natural predator for the crown of thorns starfish, but they are sought after by fishermen for the Chinese export market and this is leading to growing numbers of the starfish. The local population are predominantly Muslim. Six main ethnic groups live here: The Togeanese, Bajau, Bobongko and Buginese, along with Gorontalonese and Javanese transmigrants. Small villages are scattered about the islands and poverty is endemic. While some make a living by fishing, many others grow cash crops such as coconut, cacao and cloves on land cleared of jungle. Some resorts are foreign-run and others are managed by Indonesian entrepreneurs from elsewhere in the archipelago; few of the locals seem to reap much of a financial benefit from tourism, aside perhaps as boat pilots and staff at some of the larger resorts. The island group was declared a national park in 2004. At the end of 2017, a national park admission charge began being levied, costing Indonesians 5,000 rupiah and foreigners an astounding 30-times multiple, at 150,000 rupiah (a Kitas rate is available). You only need to pay once, so keep your ticket to show should you need to leave to re-supply in Ampana or Gorontalo. Following the national park designation, the area has been earmarked as a key tourist destination by the Indonesian government. Potential problems arising from a significant increase in tourist numbers, such as extra demands on an already limited water supply, and sewage and trash disposal, do not however appear to have been addressed by the authorities or many of the resorts. There is no central waste disposal system and, at least as far as the resorts are concerned, non-biodegradable trash such as plastic tends to be either buried or burnt (though some plastic bottles are kept to sell to recyclers and empty beer bottles are sold back—drink beer not water!). While this isn’t good news for the long-term sustainability of tourism to the Togeans, you can do some simple things to help reduce your personal impact. Bringing your own water bottle and making use of water refills (now available at almost all resorts) is one of the easiest steps. It you need to buy bottled water, buy the larger 1.5 litre ones rather than the single-use ones that litter beaches across the archipelago. Keep your plastic trash and take it back to the mainland with you. When snorkelling, collect rubbish (particularly floating plastic and bottles) and at least bring it back to your resort. Organise a beach cleanup at low tide—you’ll be surprised just how much plastic litter there is when you take a close look. Perhaps try to get the local kids involved as the more they do it, the more the desirability of a clean beach will become apparent—and perhaps they’ll start telling their parents to stop throwing their rubbish in the ocean. Small steps, perhaps, but better than no steps at all. The Togean Islands run west to east a smidgen south of the equator. The archipelago comprises six large islands and a bunch of smaller ones—apparently there are more than 60. From east to west, they are Walea Bahi, Walea Kodi, Talatakoh, Togean, Batudaka, and Una Una to the north. The main town, Wakai, is roughly in the centre of the archipelago, at the eastern tip of Batudaka, while other sizeable coastal towns include Bomba to the far west and Dolong to the far east. Accommodation can be found spread across most of the archipelago. If you’re not sure where to stay, please start with our our pick of the best places to stay on the Togean Islands. Our full selection of reviews is here. The majority of places cannot be booked online through agents like Agoda or Booking—you need to contact the resort directly. In high season (roughly June to August), reservations are a very good idea. All resorts on the Togean Islands work on a full-board basis. Your stay will be priced per person and will include your room, three meals and perhaps coffee, tea and water refills. Single supplements at some resorts can stretch to as much as 100% (which strikes us as unfair as you are not eating two people’s meals—do your research beforehand and book accordingly). Children under 10 to 12 (depending on the resort) may get a 50% discount. Most places do not offer a la carte food services throughout the day. Longer stays may attract discounts and taxi boat transfers. If you arrive from Gorontalo, you’ll be deposited at Wakai, from where you’ll need to get another boat to your resort. If you’re coming from Ampana, you may be deposited at Bomba, Wakai, Katupat or Malenge (among other spots—see our transport section for details). You’ll get a patchy telephone signal on Kadidiri, a rough phone signal (but no EDGE) off Pulau Taupan (far west on the way to Ampana) and a rather unreliable 3G signal within eyesight of the antenna at Wakai. Unless otherwise noted, assume that any accommodation listed here has no phone signal and no internet access whatsoever. If you need to be online daily, or even simply require the ability to be in regular telephone contact, the Togeans are not for you. There are no ATMs or banks in the Togeans so bring plenty of cash with you to cover the cost of your stay. Accommodation and food is paid in rupiah, while dives may be charged in US dollars or euros. If the resort you are staying in has a website with prices in US dollars or euros, it can be a good idea to pay in that currency as some of the exchange rates the resorts use are a little unorthodox—and not in your favour. The nearest cash machines that accept foreign cards are in Gorontalo (most major Indonesian banks) or Ampana. It is possible to do a daytrip to Ampana for money, but not to Gorontalo. The Togeans are a risk area for both malaria and dengue fever. Be vigilant about applying mosquito repellent both during the day and at night and consider taking an antimalarial such as Malarone or doxycycline if you are planning a prolonged stay (or travelling extensively elsewhere in Sulawesi as well). The nearest hospital is in Ampana; it’s basic but they do have facilities for malaria testing and treatment. Rats are common across all the islands—take care to lock up any food and snacks in the evening to try and keep them at bay. Togean Islands Travel Guide Book is a free booklet that you can pick up at travel agencies in Ampana. It lists all the resorts and has detailed transportation information. The InfoTogian website is also a terrific and frequently updated online resource. Please sign up as a Travelfish member to download the Togean Islands guide PDF (17.2 MB, 71 pages). Membership costs just A$35 per year (less than A$1 per week) and gives you access to over 250 PDF guides. Last updated on 14th April, 2018. Browse our independent reviews of places to stay in and around Togean Islands. Read up on where to eat on Togean Islands. 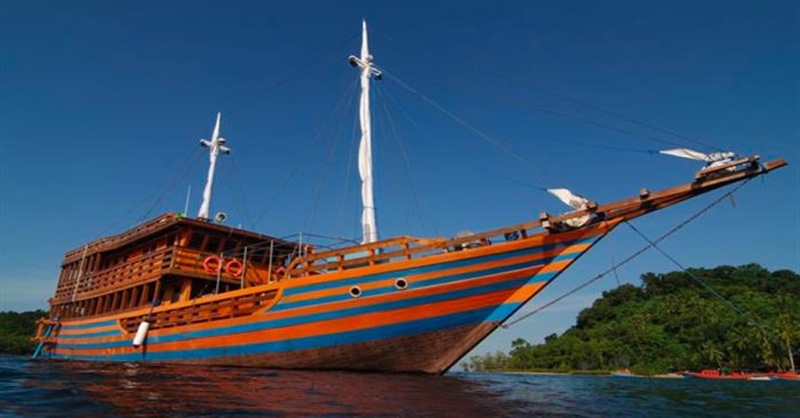 Check out our listings of things to do in and around Togean Islands. Read up on how to get to Togean Islands. Planning on riding a scooter in Togean Islands? Please read this.  Use the above map to find specific destinations in and around Togean Islands which are listed on Travelfish. Bed icons indicate a guesthouse, hostel or hotel, the knife and fork is an eatery or bar and the four-way circular thingy marks sights, attractions and other points of interest. Click on any icon for a short pop-up and a direct link to the page for that spot. If you are in the area, use the teardrop icon near the top left to show your position on the map (you'll need to allow position sharing for this last feature to work).